Saturday 10/13/18– PRACTICE AT 7:30 AM AT TURNING BASIN, BUS LEAVES FOR VAN CORTLAND AT 10:30!! Friday 10/12/18-Those competing tomorrow completed lower leg drills ran 6-8 miles and strides. Those not competing completed BIG 24s followed by 1.5 m up, SDS (4) and 6-8x 800m on a 4-5:00 cycle. Top guys were led by Jon Sauer with a 2:35 avg on a 4:00c, top ladies led by Jillian with a 2:55 avg (7x 8 4:30c). 1.5 miles down and 4 x 100m sprints. Thursday 10/11/18– rest day (light run) and mindfulness exercises. Wednesday 10/10/18-BIG 24s, lower leg drills, run to Lewis Chamberlain Park, 10-16 laps on 1/2 mile grass loop, run back to school. 8-11 on the day. 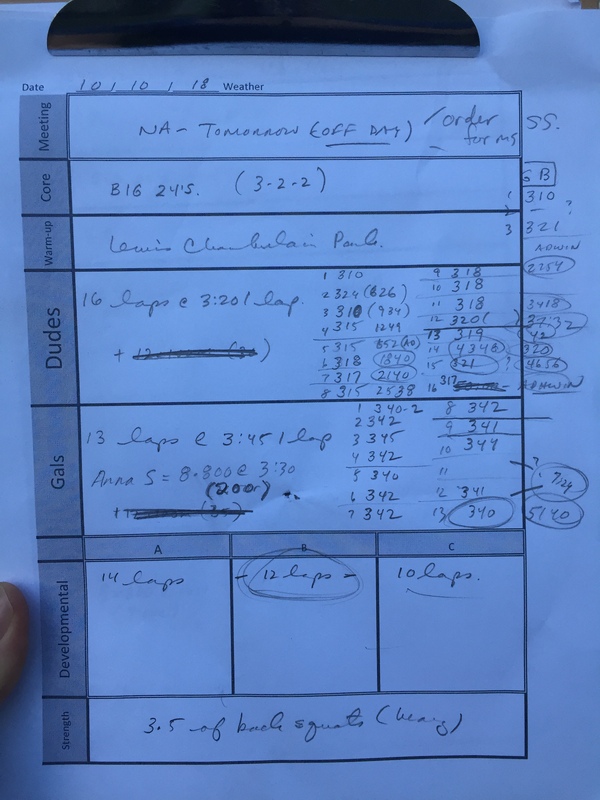 Tuesday 10/9/18– 15:00/ SDS (8) 5k race, cooldown, some naughty little boys had to run 17 x 275 on a very short (60s) cycle after their race. Monday 10/8/18– kids ran 4-6 miles with strides.